New review for the book! 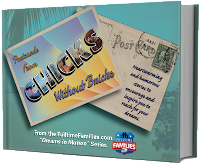 I wanted to share another review for Postcards from Chicks Without Bricks! Postcards from Chicks Without Bricks is a collection of travel stories written by today’s best travel bloggers. Heartwarming and humorous, these stories will inspire you to pursue your dreams. Buy it now! Available for iBooks and eReader. Makes a great gift! Meet the chicks! Check out the website, meet the Chicks, and watch for more info, opportunities, and hard copies!